Turn the gas control knob fully clockwise to the “l” (off) position. Wait five (5) minutes so any build up of unburnt gas can escape. If you then smell gas, stop and follow “C” in the safety information. If you do not smell gas, proceed to step 4. Turn the knob to the “Õ” (pilot) position. 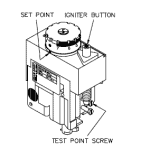 Depress the knob fully (until star disappears below housing) and after 30 seconds, whilst keeping the knob depressed, repeatedly press the igniter button (for up to 40 seconds) until the pilot flame ignites. Warning: Keep your face clear of the combustion chamber opening while pressing the igniter.Note: It is not possible to depress the knob fully if the gas control has activated its safety shut-off feature. In this case, wait 60 seconds for the gas control to reset. 6. Keep the knob depressed for 20 seconds after the pilot flame lights. The pilot can be checked by looking through the large opening below the gas control. 7. Release the knob and check the pilot is still alight. 8. If the pilot has failed to light or has not remained alight, turn the gas control knob to the “l” (off) position. Wait five (5) minutes for any unburnt gas to escape and then begin again at step 3. Warning: Failure to wait five (5) minutes may result in a fire or explosion. 9. When the pilot flame remains alight with the gas control knob released, turn the knob anticlockwise to the setting of „6‟ for a Rheemglas or Optima model, or to the setting of „7‟ for a RheemPlus model. 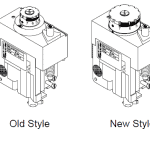 These settings will give a water temperature of about 60°C („6‟) and 65°C („7‟) respectively. 10. Refer to “Temperature Adjustment” on page 5, if further temperature adjustment is required. 11. Replace the access cover. The main burner will now automatically ignite when heating is required and extinguish when the water has been heated to the set temperature. If the main burner does not light at the selected setting, the water may already be at the selected temperature. How to Relight Your Rheem Hot Water System Best Price!